Study demonstrates using an uncompetitive inhibitor as a probe to monitor the conformational change induced by compound binding with an HTRF assay. ASSAY & Drug Development Technologies offers a unique combination of original research and reports on the techniques and tools being used in cutting-edge drug development. The journal includes a “Literature Search and Review” column that identifies published papers of note and discusses their importance. GEN presents one article that was analyzed in the “Literature Search and Review” column, a paper published in Analytical Biochemistry titled “Detecting S-adenosyl-L-methionine-induced conformational change of a histone methyltransferase using a homogeneous time-resolved fluorescence-based binding assay.” Authors of the paper are Lin Y, Fan H, Frederiksen M, Zhao K, Jiang L, Wang Z, Zhou S, Guo W, Gao J, Li S, Harrington E, Meier P, Scheufler C, Xu Y-C, Atadja P, Lu C, Li E, and Gu XJ. A homogeneous time-resolved fluorescence (HTRF)-based binding assay has been established to measure the binding of the histone methyltransferase (HMT) G9a to its inhibitor CJP702 (a biotin analog of the known peptide–pocket inhibitor, BIX-01294). This assay was used to characterize G9a inhibitors. As expected, the peptide–pocket inhibitors decreased the G9a–CJP702 binding signal in a concentration dependent manner. In contrast, the S-adenosyl-L-methionine (SAM)–pocket compounds, SAM and sinefungin, significantly increased the G9a–CJP702 binding signal, whereas S-adenosyl-L-homocysteine (SAH) showed minimal effect. Enzyme kinetic studies showed that CJP702 is an uncompetitive inhibitor (vs. SAM) that has a strong preference for the E:SAM form of the enzyme. 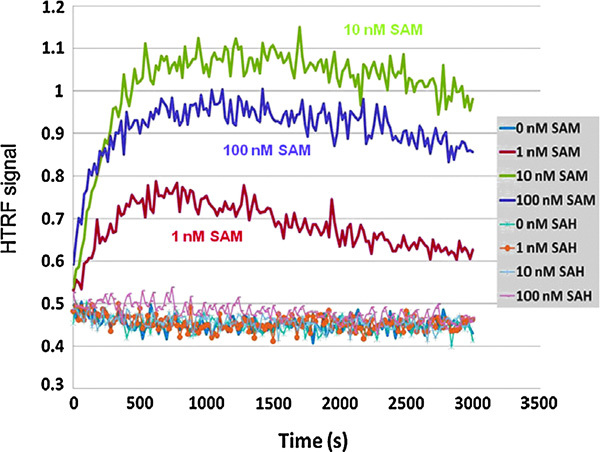 Other data presented suggest that the SAM/sinefungin-induced increase in the HTRF signal is secondary to an increased E:SAM or E:sinefungin concentration. Thus, the G9a–CJP702 binding assay not only can be used to characterize the peptide–pocket inhibitors but also can detect the subtle conformational differences induced by the binding of different SAM–pocket compounds. To our knowledge, this is the first demonstration of using an uncompetitive inhibitor as a probe to monitor the conformational change induced by compound binding with an HTRF assay. Choosing the right enzyme construct is an important step in assay development. Whether to use full-length or truncated variants and which posttranslational modifications to include are a few of the key questions when developing the assay. Furthermore, the order of the enzyme reaction should be understood when setting substrate and cofactor concentrations. An interesting finding for the histone methyltransferase (HMT) G9a is described in this article in which a substrate peptide binding assay was found to be sensitive to conformational changes mediated by the S-adenosyl-L-methionine (SAM) pocket. The HMT family of enzymes all use a SAM cofactor to transfer a methyl group to either lysine or arginine of proteins. This study used a number of tool compounds, which included peptide competitive compounds. BIX-01294 (Figure 1) is one of the first peptide-binding site inhibitors, and to construct a competitive-binding assay the authors first synthesized CJP702, a biotin analog of BIX-01294. An HTRF binding assay was enabled using a GST-tagged G9a and streptavidin-APC. Compounds known to be competitive with peptide were used to validate the assay and these compounds showed the same rank order in potency as the enzyme assay, although the IC50 values were weaker in the binding assay compared with the enzyme assay. SAM competitive compounds were then tested, but these were found to increase the HTRF signal. Reducing the concentration of GST-G9a and CJP702 from 500 nM to 60 nM and 250 nM, respectively, showed a very low basal signal, which was likely due to nonspecific interactions because this signal could not be reduced by peptide inhibitors. Figure 1. Binding of GST–G9a to CJP702 in the HTRF-based assay. (A) Chemical structure of BIX-01294 and CJP702. (B) Inhibition of G9a’s enzymatic activity by BIX-01294 and CJP702. (C) Binding of GST–G9a to CJP702 detected in the HTRF assay. However, addition of SAM or sinefungin (and analog of the enzymatic product SAH) caused a large increase in the HTRF signal. CJP702 was derived from BIX-01294, which is an uncompetitive inhibitor with respect to SAM. 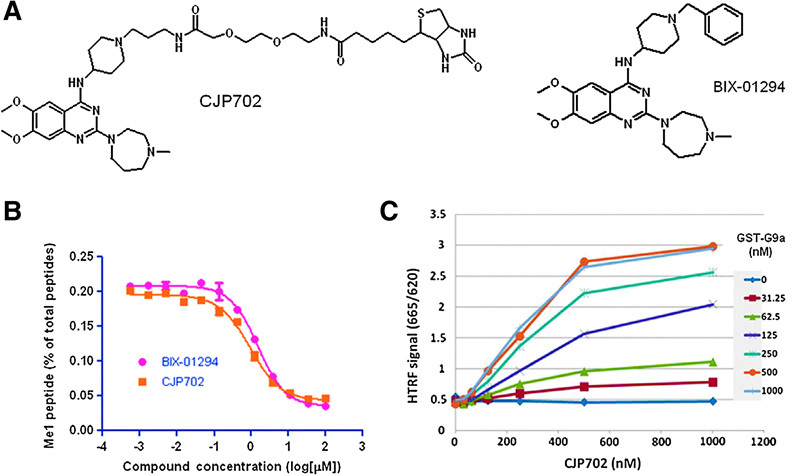 Therefore, the reason for increased signal upon addition of SAM to the binding assay was thought to be likely due to CJP702 also acting as an uncompetitive inhibitor, and detailed kinetic analysis confirmed this mode of inhibition for CJP702. Interestingly, SAH did not promote an increase in HTRF signal, suggesting that SAH binds to a different conformation. With this mind, the HTRF signal reports on conformational changes due to SAM-pocket binding. The reconfigured peptide binding assay was then used to measure SAM-pocket binding compounds in a kinetic mode (Figure 2). 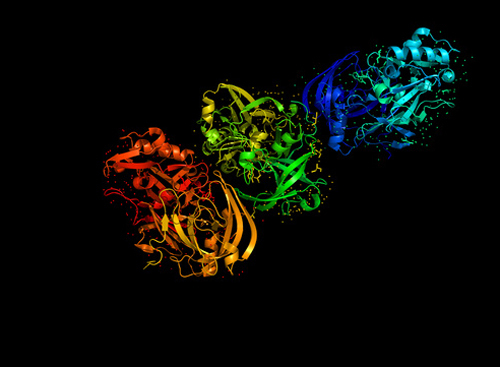 The signal increases are due to conformational changes, which involve several steps, including binding of SAM to free enzyme, resulting in a conformational change in the enzyme allowing CJP702 binding. The rate-determining step is unknown but the t1/2 from kinetic analysis sets the lower limit on the forward rate constants at ~2.5 min. Uncompetitive inhibitors can be common in certain two-substrate–requiring enzyme classes such as dehydrogenases, and this study suggests that HMTs may also have this property. Figure 2. Time course of SAM- and SAH-induced changes (or lack of them) in the G9a–CJP702 binding signal. Here, 50 nM GST–G9a and 200 nM CJP702 were preincubated with 1 nM anti-GST–Eu and 7 µg/ml SA–APC for 2 h. After that, 1, 10, or 100 nM SAM or SAH was added to the binding mixture, and the HTRF signals were monitored every 20 s for 50 min.